On 7 November 1938, Herszel Grynszpan, from Hanover, shot at the Secretary of the Legation at the German Embassy in Paris, Ernst vom Rath, and then gave himself up to the police. The 17-year-old emigrant explained the assassination attempt as an act of desperation after the deportation of his family to Zbąszyń. Two days later vom Rath died. The Nazis used his death as a reason for setting in motion a coordinated nationwide pogrom against the Jews. On the evening of 9 November, Joseph Goebbels, Reich Minister for Public Enlightenment and Propaganda, gave a hate-filled speech which was the starting signal. Contacted by radio, the regional party leaders were commanded to launch an attack against the Jews to “atone” for the assassination. A wave of murderous violence began. Synagogues were set on fire throughout the German Reich on 9 and 10 November 1938. Members of the NSDAP, the SS and the SA, often supported by fanatical citizens, forced their way into community offices, private homes and shops in order to plunder and to destroy. Almost one hundred people died in the excesses of violence, many of them murdered openly in the streets. Almost 30,000 Jewish men were arrested and sent to concentration camps where they were mistreated and humiliated. Two weeks after the violent deportation of 17,000 Polish Jews, the November pogrom was the turning point. The National Socialists’ anti-Semitic campaign of violence and terror eventually led to systematic genocide and annihilation. 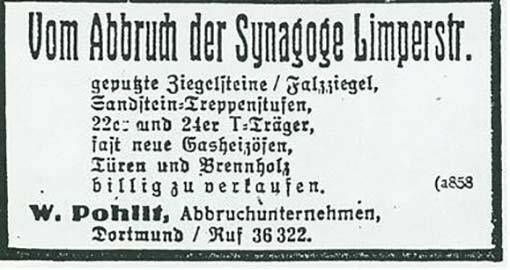 For German Jews who believed the reign of terror was temporary, the November pogrom was the end of all hope. Those who had the possibility of emigrating put all their efforts into escaping from Germany. * Interview with Kenneth Appel by project group Kindertransporte in London, 2010. Photo credit: Image at the top: The synagogue of Bochum, destroyed during the Kristallnacht. Photo Credit: City of Bochum. 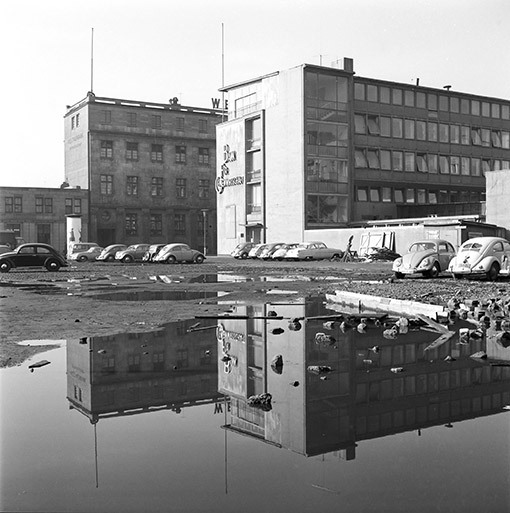 Place of former synagogue, march 1957, Photo credit: City of Bochum. In Recklinghausen, the synagogue at Limperstraße was set on fire by SA troops in the night of 9 November 1938. The day after, the burnt out building was condemned and the synagogue‘s tower brought down. Pictured is an advertisement by the demolition company, 1 March 1939.